Tomorrow marks the last official day of Black History Month, but we're just getting started in our classroom. I'm happy to see certain students really engaging with the content. It's clear to me that they're excited and curious to learn more about Black history. 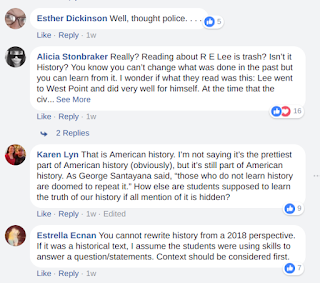 As the month comes to a close, I'm still thinking about the experience I had with the racist Robert E. Lee passage on a recent assessment I administered. The good news is Curriculum Associates has removed the passage from their published curriculum and the DOE also committed to discontinuing the passage's use. The bad news is neither CA or the DOE really took accountability for allowing the passage to be used in the first place. 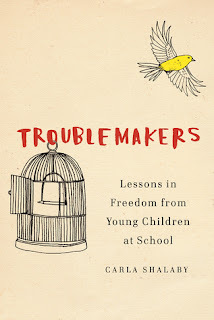 The worst news however is the reaction from many fellow educators in response to my anger. I originally posted about the passage on Facebook and it was then shared on The Educator's Room. Without taking the time to read the passage, many people responded defensively. The general sentiment seemed to be that by objecting to the use of the Robert E. Lee passages I was attempting to rewrite or erase history. I heard a similar sentiment from another colleague. I completely agree that we cannot erase slavery, or other atrocities from United States or world history, but I want to be clear that this is the opposite of my stated concern. The problem with the passage wasn't that Robert E. Lee is a bad guy. The problem was that it severely downplayed what a "bad guy" he was. There's so much wrong with the responses I got, I don't really have time to get into it all. I'll just say this: If we're so intent on teaching "history" in all it's honesty, why is the history of slavery so poorly taught in this country? Why can't I find any resources on the Black Panther Party for my students, but I can find multiple articles about Robert E. Lee that don't even mention the fact that he enslaved human beings. Let's say for argument's sake that people are concerned about teaching about the Black Panther Party because they advocated violence. Doesn't this still count as "history"? Why is this history erased, while we must teach the history of Robert E. Lee? We already know the answer obviously. 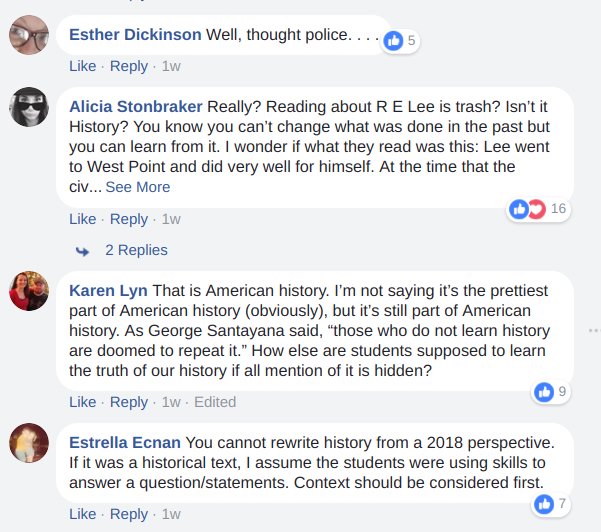 The concerns about teaching Robert E. Lee, because "history," are really just straw men arguments from white teachers who are more concerned about giving white supremacists a fair shake than dismantling white supremacy in their classrooms.